Maybe you have to be a Boomer to really appreciate this clip. But anyone is welcome to watch. 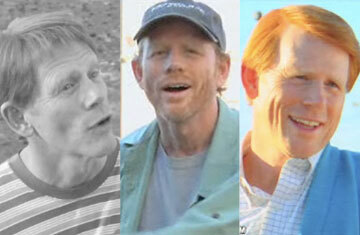 Ron Howard started as a kid fishing with the sheriff. Now he is a famous movie director. The other day he took time off to make a short movie. Listen for the theme music. Ron’s little film should bring back memories to those who remember Opie, Andy and the Fonz. All this was a direct outgrowth of Sarah Palin’s own comments in North Carolina, in which she praised the “pro-America” areas of the country. But Hayes had clearly been absent for the day in scurrilous campaign school when they explain that you aren’t supposed to specifically name the anti-American parts. . . .
Matthews later ran a clip from Bachmann’s Democratic opponent, Elwyn Tinklenberg, who had been lagging far behind Bachmann in the polls and in money raised. After Bachmann divided the nation into people who are pro-America and anti-America, Tinklenberg received close to $1 million in contribution. His poll numbers improved immediately. Bachmann also lost support from the Republican National Committee, which withdrew its support from her campaign. Tinklenberg and Bachmann are running in the Minnesota Sixth District, a race to follow on November 4. And a word for you religiously-inclined readers, Tinklenberg is a United Methodist clergyman. She: Obama? But he’s the black man, isn’t he? She: But surely a black man couldn’t become president of the United States? Me: It looks as if he’ll be elected. She: But president? That’s such an important job! In America, I thought blacks were janitors and laborers. Me: No, blacks have all kinds of jobs. She: What do white people think about that, about getting a black president? Are they upset? Are they angry? Me: No, of course not! If Obama is elected, it’ll be because white people voted for him. She: Really? Unbelievable! What an amazing country! We’re beginning to get a sense of how Barack Obama’s political success could change global perceptions of the United States, redefining the American “brand” to be less about Guantánamo and more about equality. . . . Think about it. Less than two weeks before election day and many states offer early voting. Is every member of your family voting early? If not, what sort of parent are you? This entry was posted in Politics and Elections. Bookmark the permalink. A former governor of MN, Arne Carlson, has now endorsed Barack citing Michele Bachmann’s comments as one reason. I am not in her district and I don’t feel like she’s embarassing all of Minnesota because every state has kooks. (Jesse, now HE was embarrasing!) But I was really, really mad about her comments.She had extreme views anyway but I give credit to McCain’s campaign for creating this environment. Tinklenberg is a minister and I think he’s a mayor right now. About your comment about getting your kids to vote. I sent my 18 yr old off to college with a voter registration form , the absentee ballot request AND a stamped envelope for the Secretary of State. I even highlited everywhere he had to sign. He has succsessfully returned his ballot to MN. On a completely side note regarding our Senate Race between Norm Coleman, Al Franken and Indep. Dean Barkeley. Norm Coleman would NOT have been elected 6 years ago except for the fact that Paul Wellstone tragically lost his life. Walter Mondale was wonderful to step into the race but it was a little too late and the Republicans totally exploited the supposed exploitation of Wellstone’s Memorial service.